Churchill Manitoba is known as the Polar Bear Capitol of the World. Each year, more than 1,200 polar bears migrate through the area on their way to hunt for winter sustenance. This migration period is somewhat brief (lasting only from October to November), and many people simply can't find the time to make it to the beautiful little town during this time frame. Luckily, there is plenty to do in Churchill year round. Here are just a few of the many activities the area has to offer. Avian-lovers can find a complete paradise in Manitoba. About 200 species of birds pass through Churchill each year as they complete their migratory cycles. Churchill's long daylight hours (5am to 10pm at their longest) provide you with plenty of opportunities to see the town's large number of winged visitors. 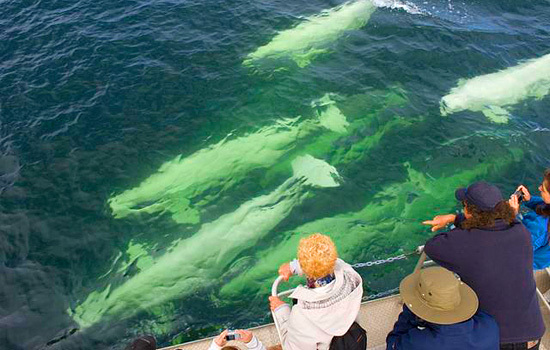 The town of Churchill claims to have the "best beluga whale watching in the world." These claims are not unsubstantiated, as the Churchill River facilitates the migration of 3,000 or more beluga whales each year. You can charter a boat tour on the river to watch these playful, aquatic mammals socialize in their natural habitat. Aurora Borealis is visible at most points throughout the year, but the phenomenon is especially evident between January and March. You can get a great view of the Northern Lights from the comfort of your Churchill hotel, or take a guided group tour into the Canadian wilderness to see the spectacle in a secluded location. The Polar Inn rents the attire you'll need to stay safe and comfortable outside during the cold, arctic nights. Many people spend years training themselves and a pack of canines in order to form a talented dog sled team. It takes a great deal of discipline and endurance for both mushers and their teams to stay level headed and energetic in arctic conditions. Luckily, you can enjoy a world-class dog sled tour without years of preparation! The town of Churchill is home to dog sledding professionals who can be hired to lead brief excursion. In one afternoon, you can experience the excitement of the Iditarod! Manitoba's polar bear migration is a spectacle that leaves many with lifelong memories, but don't worry if you can't make it during the community's peak travel period. There is plenty more to do Churchill, including hiking, bus tours and Tundra Buggy adventures. Let Canada Polar Bears help you and your family choose the perfect vacation package today! Can't find what you're looking for? Our staff can create a custom Canadian vacation that suits all your needs! Need more information on Activities And Things To Do In Churchill? Talk to one of our Canadian travel Insiders who'd be happy to answer all your questions.